Description: This TXD editor is a collaboration between DK22Pac and The_GTA to create a unique TXD editing experience for the GTA community. It aims to support every RenderWare engine game that uses TXD files, especially all PlayStation2 era GTA titles. Even platforms different than PC are supported, such as PlayStation2 and Gamecube. 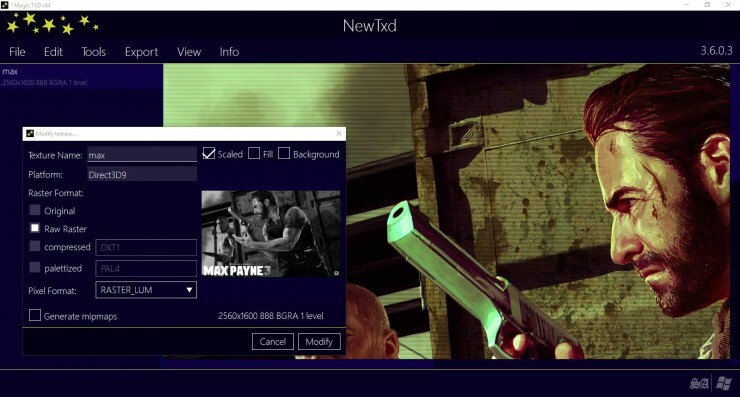 Build TXD files out of images, extract textures as PNGs from TXD files and convert your textures to every RW GTA game. Set filtering and addressing modes per-texture. Encode your font textures in luminance + alpha, for greatest quality. Quickly generate mipmaps for all your game textures using the mass conversion tool, fixing the black-roads-bug. And much more!